Most garage doors on the market today are sold as "maintenance free." However, that is not quite true if you want to have a good looking door year after year. Just like vinyl siding, but to a lesser degree, garage doors will be affected by pollution grime. The door should be washed every so often. The most convenient time is when you wash the car or water the flowers. Rollers, tracks and hinges should be lubricated with a non-petroleum based lubricant. Just buy a liter of 10W30 motor oil and a small oil can and you are set for life. Steel garage doors. Vinyl garage doors. Wood garage doors. Up and over garage doors. Curb appeal. Real estate professionals keep stressing how important curb appeal is when you are planning to sell your home. Even if you are not in the market to sell your home, curb appeal is important and your garage door plays a large, or in the case of a double garage, a very large role in how your home is looked at. 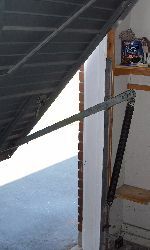 The garage door is also the largest moving component of your home. Lets have a look at your options when it is time to replace or update your old garage door. There is a large variety of styles and colours available so make sure to choose a door that will be compatible in appearance with the rest of the house. Then you have to make up your mind whether you want a vinyl, fibreglass, metal or wood garage door. The final choice to make is if you want to door to be insulated or not and if you want windows along the top. Vinyl garage doors are basically maintenance free. The doors are rustproof, dent proof and scratch resistant. Even if scratched it will be hardly noticed as the colour is consistent throughout vinyl much like ice cream. Steel or aluminum garage doors are very popular. They require little maintenance. One word of caution though. If your youngsters love to play hockey and are planning to use the driveway for practice shooting you may want to consider a vinyl garage door as most metal doors are not dent proof. Wood garage doors. There are still plenty of the old style heavy up-and-over garage doors around. 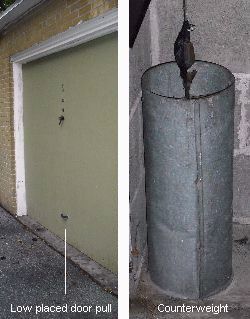 Two cement filled containers, one on each side of the door, are used as a counterweight to operate the door, there are no springs. The door handle is always installed 12"-16" (30-40 cm) from the ground. It is a very effective system that requires very little maintenance. Today, wood doors come in a wide variety of styles and can be stained, shellacked or painted. If the door is facing south or south-west, avoid dark colours since they absorb more heat. Garage door windows. 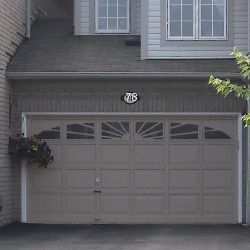 Decorative garage door windows can really change the curb appeal of your home. There is a large variety of styles and glass options available. Just make sure the glass is frosted to conceal the contents of your garage from prying eyes. Insulated garage doors keep the garage warmer which may help to keep rooms adjacent and above the garage warmer. For older homes having an insulated door is almost a must as these homes are often poorly insulated.